You may have noticed the hashtag #RRSciFiMonth and its related images popping up all over today. That’s because it’s November which means it’s that time of the year again! Yep, it’s Sci-Fi Month! The BiblioSanctum has had such a great time being a part of this event in previous years that we’re participating again in 2017. This year, the original creator Rinn Reads will not be able to organize it, so the mantle is being passed down to Lisa at Over the Effing Rainbow and Imyril at X+1 who will be taking on hosting duties. Starting today, we’ll be joining other bloggers, authors, and readers in a month-long celebration of everything science fiction. That doesn’t mean we’ll stop covering all our other favorite speculative fiction genres though! You will most definitely continue to see our usual fantasy reviews, weekly features, author spotlights, and all that other fun stuff. The only difference is, some of our reviews and posts will branch off from the usual to encompass the various mediums that science fiction reaches. Some of that might include our weekly features like Waiting on Wednesdays spiced up with a sci-fi touch, or discussions that go beyond books to talk about sci-fi movies, television, games and other media. The Dancing Stormtroopers are back! Simply look for posts tagged with “SciFi November” or those that contain the SciFi Month banner or button. For more information about this event visit the SciFiMonth 2017 Announcement post, where you can also sign up to participate if you’re interested. Everyone is welcome, and you can join up anytime! Be sure to also follow the hashtag #RRSciFiMonth on Twitter so you won’t miss a thing. How long have you been a fan of science fiction? Why do you like sci-fi and what is your favorite thing about it? What are your favorite books/games/films/TV shows in the genre? 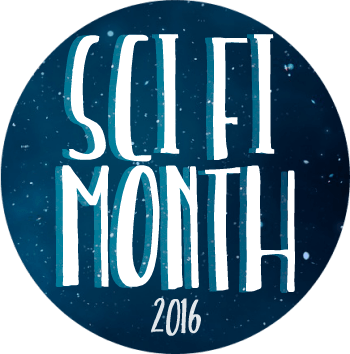 What are your plans for Sci-Fi Month? I’m excited too! I was wondering if the hashtag was going to change though? Isn’t RR Rinn Reads? Yep, though I believe they’re sticking with the same hashtag so that participants from previous years won’t get confused. And hopefully Rinn will rejoin the event one day! This is my first time doing Sci-Fi Month, and I’m super excited! Woot, sci-fi! Going to love this month. Well, I didn’t make any firm plans, I’ve just been rushing about a bit. But, my next read is Artemis. Thought I might watch and review something – maybe the new Blade Runner. Plus I watched Stranger Things 2 which could also fit in. My next read is Artemis too! Here’s hoping we’ll both love it!